What would you do if you heard that a tornado with 165-mile per hour winds leveled more than 30 homes in a neighboring community? 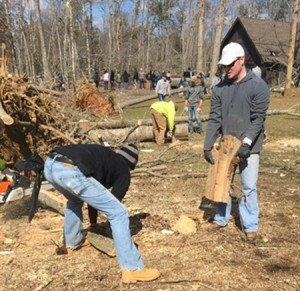 Assistant Branch Managers Kyle S. and Patrick D. didn’t think twice — they gathered supplies and stepped up to lend a hand. When the tornado hit Appomattox, Virginia, earlier this year, it hit the town hard. The twister blazed a path about 400 yards wide and destroyed everything it touched on the ground for about 13 miles. It wreaked havoc on Appomattox, damaging more than 130 homes in its path. In true Enterprise fashion, Kyle’s teammates were quick to help. Enterprise Truck Rental’s Kelly D. contributed supplies and John H. helped Kyle get a rental truck approved for him to use in the relief efforts. If one thing is certain, Kyle and Patrick agree that seeing the aftermath of a tornado firsthand definitely puts things in proper perspective. “It was hard, physical labor, but we were where we needed to be,” says Kyle, who felt a personal sense of duty to help.